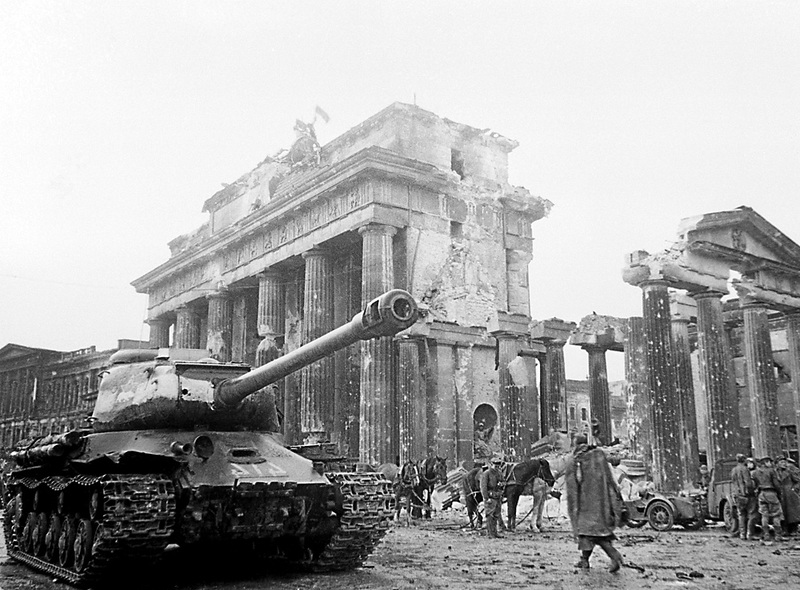 A Soviet tank near the Brandenburg Gate in Berlin. May of 1945. The initial period of World War II for the USSR was a real catastrophe for the Red Army’s tanks. Nevertheless, after having overcome the first blow, the Soviet Union was able not only to restore its armored forces but, recognizing its mistakes, to transform them into its main weapon on the battlefield. Following the German invasion of June 1941 it took a long time for the USSR to recover from the miscalculations made in the pre-war years, and it cost the country vast losses in infantry and materiel. But by the third year of the war many of the errors had been fixed, and the Red Army had got rid of its massive unwieldy machines, leaving it with a 100-percent modern mechanized force. But while the tank divisions could now boast better motorization and better-trained crews, problems still remained, the most important of which concerned tactics for using the armored forces. Here the Soviet generals still had a lot to learn. This was clearly demonstrated by the Battle of Kursk, one of the largest battles in world history, in which an unprecedented number of soldiers fought on both sides. One of the biggest tank clashes in history, the Battle of Prokhorovka, occurred near Kursk in July 1943. No one talked about the real results of that battle in the Soviet years. Everyone thought that it was an indisputable Soviet victory. But the truth was different. The Soviet command's attempt to stop the German offensive with a frontal blow using tanks in a narrow part of the front in conditions of rough terrain and with the enemy having a definite advantage in terms of armament proved to be a failure. The advancing Soviet units lost more than half of their tanks – 2.5 times more than the Germans. Only Soviet success on the other parts of the front saved the situation. But the Soviet command was now faced with the problem of how to use its tank forces. In the second half of the war the Soviet generals finally understood that the tank is not a universal war instrument. It needs to be used correctly in order to realize all its advantages to their full potential. There is no sense in having tank units storm the enemy's prepared fortifications: Modern anti-tank artillery can easily eliminate practically any armored advantage. Concentrating tanks in armored handfuls and using them in different sectors also has a series of shortcomings – primarily it leads to the dispersion of forces. The tank is the modern equivalent of the cavalry. It is better to use an armored handful in a situation when the storming of enemy positions has already begun. In order to break through enemy lines it is better to use infantry reinforced with tanks. In the event of a successful tactical breakthrough in a narrow territory the tank turns into a threatening weapon of destruction. In 1944-1945 the Soviet command confidently broke through enemy lines with their tank armies, expanding the breach, cutting the rear communications, throwing back the enemy's reserves and isolating its units, creating huge salients. In the early days successful attacks by the Red Army's tank divisions would usually be stopped rather quickly by the Wehrmacht, and often with infantry alone. But towards the end of the war the Soviet tanks made it to the German rear, which basically meant the destruction of the whole front. In April 1945 the tank wedges of the two Soviet fronts united west of Berlin and sealed the fate of Hitler's capital. The operations on the German front were often planned and realized "off the cuff" – there was just no time for thorough organization. But the Soviet offensive against the Japanese Kwantung Army in Manchuria in the summer of 1945 was a real masterpiece of operational art. In its scale it was no less significant than the largest battles against the Wehrmacht. The Soviet army had to surround and destroy the enemy's well-armed million-strong army on an enormous territory. And here the protagonists were the tanks. Carrying out the command's order, the Soviet tank army realized a maneuver unprecedented in its complexity. Having moved through hundreds of kilometers of Mongolian desert, surmounting mountain ridges, the army made it into the enemy's far rear, where no one had expected it. The tanks immediately entered battle, obliterating three of the enemy's divisions, and encircling the entire Kwantung Army. Today the USSR's armored forces' actions in the Manchurian Operation are still considered a shining example of military strategy and are studied in military academies all over the world. However, it took four years of heavy losses and mistakes this incredible victory.